Spiderpig, a young California sea lion with a severe entanglement injury, demonstrates how damaging the problem of ocean trash can be. 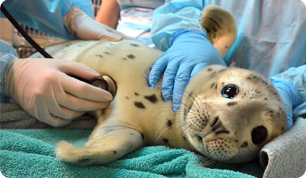 He recently arrived at The Marine Mammal Center, just in time to show the importance of Coastal Cleanup Day. Spiderpig, along with fellow sea lions Hollywood and Exclamation, was released back to his ocean home on Coastal Cleanup Day. It was a fitting homecoming for this young sea lion, after being treated for a life-threatening entanglement in ocean trash. More than 100 supporters of The Marine Mammal Center were on hand to cheer on the three pinnipeds, as they made a dash for the surf at Scotty Creek Beach on the Sonoma Coast. Volunteers also scoured the beach picking up trash and debris, making a small but symbolic step forward to prevent more entangled marine mammals from suffering due to human negligence. Hollywood and Spiderpig are the first two sea lions to go out, followed immediately thereafter by Exclamation. Spiderpig is a young California sea lion that suffered a severe injury due to an entanglement with fish netting. International Coastal Cleanup Day is coming up on Saturday, September 20, and you can be part of healing the ocean! Once again, The Marine Mammal Center will be taking part in the event. Working toward a clean and healthy ocean is an important part of our mission because we want our patients to be able to return to a place where they can thrive. Plastic bags, packing straps and fishing debris make up a large portion of the garbage that is polluting our ocean and also pose a major threat to our pinniped patients. Each year, the Center rescues a large number of seals and sea lions that have become entangled in ocean trash. When a marine mammal becomes trapped in plastic packing straps or fish nets, it can be a life-threating situation. A young seal or sea lion is growing rapidly and can be slowly strangled by the debris. In most cases in which the animal is rescued, an entanglement injury will heal quickly after the entangled trash is removed. The wound is cleaned and the patient is given antibiotics to fight possible infection. In some cases, a seal or sea lion can be released immediately after being disentangled. Release back to the ocean can be the best thing for the animal, because the salty seawater can speed up the healing of the wound. In 2013, the Center rescued a total of 18 pinnipeds with entanglements. 11 of these were California sea lions and seven of them were northern elephant seals. Eight of the sea lions and six of the elephant seals were ultimately released back to the ocean to get a fresh start at a healthy life. In addition, veterinarians from the Center investigated the carcasses of a harbor porpoise and a gray whale that had washed up on beaches as a result of entanglement injuries. So far in 2014, the Center has rescued 18 pinnipeds entangled in ocean trash. 14 of these were California sea lions and four were northern elephant seals. Eight of the sea lions, including Shammyrock, Pua, Snouty and O’Neill, were released back to the ocean. Four of the elephant seals were released, including one with the charmingly appropriate name of “Disentangled.” The Center's veterinarians also performed a necropsy on a dead minke whale that washed ashore in Mendocino County. The carcass had the mark of a long thick line, characteristic of a crab pot line, giving the vets reason to believe that "the whale became entangled in fishing line or gear and while struggling to free itself caused traumatic fracture to the vertebrae and hemorrhage in the lung and diaphragm." The latest victim of ocean trash to be admitted to the Center has the glamorous name of “Spiderpig.” He is a yearling sea lion that was rescued in Goleta by the Santa Barbara Marine Mammal Center on September 1. He was entangled in fishing nets, which were wrapped tightly around his body, cutting deeply into his neck and the corners of his mouth. Spiderpig is a yearling, meaning he is just a year old, a time when he is growing rapidly. Had he not been rescued, it's likely that the netting would have made him less successful at hunting fish and could have suffocated him as he grew larger. Spiderpig was transferred to The Marine Mammal Center facility in Morro Bay and then to our main hospital in the Marin Headlands, where veterinarians could closely monitor his wounds. He weighed just 37 pounds when he arrived at the Center, slightly underweight for a sea lion his age. He was likely having a difficult time eating due to the entangled net. Since the netting was removed, he has had a strong appetite, a good sign that he will recover fully. Look out indeed, for Spiderpig shows in gut-wrenching detail the consequences of ocean trash. The harm to wildlife is just one aspect of the damage caused by a polluted and unhealthy ocean. The health of human beings is also affected because we consume large quantities of food from the sea. No matter where you live, you can take part in International Coastal Cleanup Day and help create a healthy ocean environment for everyone! Thousands of volunteers will be coming together to join the largest volunteer event in the world. They will be picking up trash and other debris along beaches, creeks and waterways in nearly 100 countries. The Marine Mammal Center will be hosting cleanup teams at Rodeo Beach, just down the hill from our hospital. Look for the Center's outreach vehicle in the parking lot. Bring gloves, a bucket and all your friends! Sign up for Coastal Cleanup Day! Cleaning up the ocean will be a daunting task for generations to come. Don’t believe Homer Simpson, who famously said “If something’s hard to do, then it’s not worth doing.” Homer was wrong. You can help entangled animals like Spiderpig get back to the ocean. Please consider a donation to help heal Spiderpig's wounds and care for other patients like him. How Long Does it Take for Trash in the Ocean to Decompose? A tin can that entered the ocean in 1986 is still decomposing in 2036. A plastic bottle that entered the ocean in 1986 is still decomposing in 2436. A glass bottle that entered the ocean in 1986 is still decomposing in year 1,001,986.